These DIN rail mounted controllers offer more flexibility than their panel mounted equivalents and are often used as alarm modules or PLC expansion modules installed inside a panel. These instruments provide on/off or multi-segment PID temperature control for refrigeration and heating applications. The K85 DIN rail temperature controller offers accurate 8 segment process control on a wide range of input options and up to 3 outputs, including a variety of alarms. It can be linked to a PO4 touchscreen display/controller via the RS485 link. PID or ON/OFF Control – The K85 process controller can control both heating and cooling processes, using ON/OFF control or choice of Self-tune, FAST or Oscillating auto-tune PID control. Temperature Range – Between -200C and +1760C subject to sensor choice. 4 Set Point / 8 Segment Control – 4 set points are available, enabling 8 segments (4 x ramp/soak segments) to be controlled as part of an overall process (e.g. multi-zone ovens, processes that require bringing back to ambient temperature following high or low temperature process). Compressor Protection – The K85 has a parameter for specifying time delay in order to protect compressor. Timer – There is a choice of 5 built-in timer functions to enable a variety of process control features including delayed start up and asymmetrical oscillator. Alarms – Up to 3 alarms can be programmed and assigned to an output. Various thresholds and deviations can be detected and a range of functionality applied including hysteresis and delay. There is also a Loop Break Alarm. Single LED Display – The K85 DIN rail temperature controller has a display of 4 LED digits, 12mm high, in red. There are also 3 output status lights (red) and a “bargraph” display indicating whether the current value is equal to, above or below the current set point. Size – The front panel is 70mm by 60mm in size, increasing to 84mm in height at the rear. Keyboard – 4 keys (U, P, UP and DOWN), are arranged under the display area, providing parameter access and other functionality such as alarm acknowledgement/reset. IP40 – The IP rating of this device is 40 – suitable for indoor use only, avoiding excessive moisture or dust. 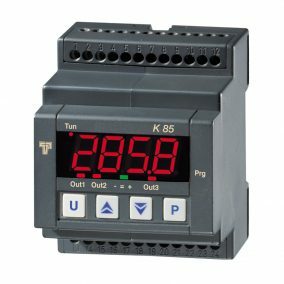 Inputs and Outputs – The K85 PID controller has up to 3 inputs (one for sensor and 2 digital) and 3 relay outputs. One input is assigned to a temperature sensor and the other is used as a control signal. The unit can cater for a wide range of different input types including TC, RTD, PTC, NTC, mA or V. Both outputs are a relay/SSR outputs, and can be used for device control, or configured for a variety of digital control functions including alarm and timing signals. Programming – Parameters are manually configurable via the front panel keys. Communications – The unit has a RS485 serial interface to allow master-slave communications with other units. The unit can also be controlled or monitored via a PO4 touchscreen. The TLZ35 temperature controller is a DIN rail mounted digital thermostat, with a manual or timed defrost control function, compressor protection and alarm function. ON/OFF Control – The TLZ35 provides ON/OFF control for temperatures between -50C and +150C, depending on sensor type. Defrost Control – Defrost can be set according to time intervals, or a manual defrost can be initiated via the keyboard. Compressor Protection – A “power on delay feature” is designed to prevent damage to the compressor. Behaviour of this feature for a specific application can be set via parameters. Temperature Alarms – The unit can be set to trigger an alarm for minimum and maximum temperatures. An alarm is indicated in 3 ways: on the display via the AL LED, using the internal buzzer (optional), and by the AL output to an external alarm. When an alarm is triggered the display alternates between current temperature and either “HI” or “LO” as appropriate. 4 Digit LED – The unit has 4 red LED digits 12mm high. There is also a decimal point, a green standby light (SET) and 3 status lights – for OUT (Output status), DEF (Defrost) and AL (Alarm). Size – The front surface of the display panel is 70mm by 60mm in size – total height of the unit is 84mm. Keyboard – There are 4 mechanical operator keys: U, UP, DOWN and P, arranged horizontally under the LED display. Display options – Current temperature values can be displayed in Centigrade or Fahrenheit, and to the nearest 0.1 or 1.0 degrees. IP Rating – Due to the type of mounting, this unit is not IP rated, and should not be used in environments with high levels of moisture or dust. Inputs and Outputs – There are 2 inputs and 2 relay outputs. One input is assigned to a temperature probe (PTC or NTC) while the other is a digital input which can be used as a control signal. One output is used to control the compressor (or heating device as appropriate to the application), and the other is assigned to Alarm. Programming – Parameter programming and access (including password protection) is carried out via the keyboard, or via the “KEY 01” device. The KEY 01 device is not supplied with the unit but can be ordered separately. It allows the parameter settings of a device to be uploaded onto the key, and then downloaded to multiple other units – a useful time saving feature in a research or production setting where it is important to have identical settings on many controllers. K85P-HIRR-SD-UK DIN MOUNT CONTROLLER ALARM 100-240VAC SUPPLY, 0/4-20MA INPUT, 2 X RELAY OUTPUTS, RS485, 8 SEGMENT PROGRAMMER & TIMER.